Last Sunday saw me in extremely different colors. Even Saturday gave me a sleepless night. I have been driving for last four months, cross my fingers, I didn't give chance for even a scratch. Over this period I have traveled to Ha, Paro and Thimphu with full confidence. But with all the confidence in tact I still panicked over the idea of going for driving test. Until I bought my car driving was almost alien to me. My cousins have cars, my uncles and aunties have too but for the unfortunate fact that my parents don't have I am deprived of even sitting in the driver's seat of their cars. I never thought I could drive someday. Before I decided to buy my car I already registered for my learner license. I have to be six months old in possession of the learner license before I could sit for the test, but I was told that if the blue book (ha ha blue book is green) is registered in my name I could be considered for the test just in three months, but you know I have test phobia. The last time I registered, it was about the right time in all sense; my learner license was six months old and I was more experienced. But experience on the road is nowhere similar to that in the stupid box; god knows why they are testing us in there. So last Saturday I drove to the same spot where they would test us and did my practice. It was not so bad after all. All I had to do was to memorize the marks in the box; where to stop, where to start turning, where so and so. I was told that it's impossible to pass the test in Santro but after my practice I disagreed. Seeing me worried, my neighbor angay shared her piece of mind, "The car is yours and the road belongs to the country, why in the world do you have to sit for the test and pay for the permission to drive your own car?" How true! I began to ponder over it and it still sounded true. Will there be an answer to this question? Sleepless Saturday and an appetite-less Sunday morning made me sick. My wife went with me as a lucky charm. I sat for the written test; I already got several questions from outside from those who already sat it. There were 20 multiple choice question of 40 marks of which 24 is the pass mark, in schools it would be 16. Well I think I scored cent percent because I opened the learner license and referred to it, I don't know if it is even allowed; nobody stopped me anyway. Then came my turn to enter the box, I looked at my lucky charm and saw her more worried than me but she has counted on me since she saw me do well during the practice session. The front-in-front-out was done like a professional but the back-in-back-out nearly got me in trouble. I was drenched in sweat by the time I came out successfully. The whole Sunday I kept smiling, called up so many people of which my mother was the first. So, from last Sunday I am given the permission to drive my own car, ha ha ha..
U took the test at Hesothangka? I have seen people being fail at the written test and not being allowed to take the practical driving test. Lucky you that u had an open book test. And, COngratulations. No reaosns for u to drive recklessly now. Drive safe..
Hi,congrats for being given license to drive your own car. I used to feel the same like you before I got the license but now I feel sometimes that the licensing procedures are inadequate. 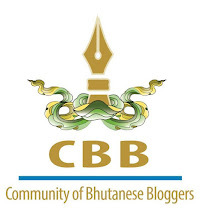 Bhutanese drivers are mostly tested in box which is a very old fashioned. In fact these days they should be tested by making drivers do the perfect parking on the sides of road with drains on one side and cars in two other sides. You will agree with me if you see kind of parking our licensed drivers are used to. The concept of highway driving exams should be improved by teaching the drivers to use double lane roads effectively. Most get confused while ovetaking on double lane. 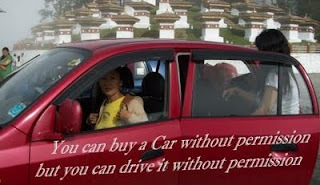 Most Bhutanese are impatient and careless in driving. Accidents mostly happen because of carelessness on the road. And most drivers are impatient. Everyone wants to get in front. Taxis are notorious for such things. More than the driving license, life is important. Even if we don't get killed, we are putting the life of other people at risk by being a rash driver. We do need licensed driver for our own safety. Somebody sitting for test and getting the license secures other people and not the driving license holder alone. It is just a personal opinion and I wish you the best on the road with your car.